From the true birth of the American automobile and Henry Ford’s groundbreaking moving assembly line, Ford has been an iconic name and a true American made product. 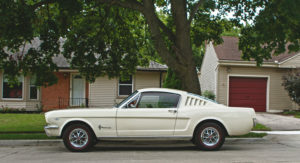 From the vehicles that revolutionized transportation, like the Model A and Model T introduced in 1908 standardizing the left side steering wheel, to the muscle car classics like the Ford Mustang, the modern fuel efficient vehicles like the Ford Fusion, and the full line of SUVs, the product line has grown and changed with the maturing of our great country. Ford Trucks have come through the same revolutionary journey as well from the step side pickup to the power diesels of today. Big, strong and more efficient, Ford trucks and SUVs are commonplace on the highways and back roads of America. Ford Motor Company was founded June 1903 in Dearborn Michigan (just outside Detroit) as an American car company and continues as one of the largest and most profitable companies to operate factories throughout the United States today. Two brands emanate from those factories: Ford and Lincoln. Ford cars are built with quality parts, and whenever service is necessary, make sure your automotive professional uses original, top quality replacement parts. Fords today can operate in excess of 200,000 miles when well maintained. By the way, did you know that Ford Motor Company once owned 5 other luxury brands? Volvo, Land Rover, Jaguar, Aston Martin and Mercury were all once part of the Ford Motor Company family of cars. Over time, those brands were sold to other companies and Mercury was discontinued. To learn more about Henry Ford’s legacy, stop by The Henry Ford Museum and Greenfield Village if you find yourself in Dearborn, Michigan … you won’t regret it! Want to an ASE Certified mechanic to look over your Ford vehicle and make sure it is in proper running order? Stop by our auto repair shop in Boulder Colorado. Our goal at Allegiance Automotive is to keep your Ford vehicle in the best condition possible and help you get the most miles possible for maximum return on your investment.